Responding to Customers In Social Support May Be Hurting Your Brand. Why? You may be teaching your customers to yell at their friends in order to get your attention. You must develop a social support strategy that involves an escalation process, will scale, and use the right internal processes and software to succeed. In the above recorded webinar, you can watch the replay and learn about the business case (why many companies have fallen down in social media crises) understand market data on trends on adoption rates and spending, and a five step escalation framework with over a dozen examples. Responding to Social Customers May Hurt Your Brand. As stated above, any company who haphazardly responds to customers in social channels without a strategy may be encouraging customers to yell at their friends to get your attention. This will only spiral down further and further. Outbound Strategy –not Inbound: Support groups must go where customers already are, and this means beyond the call center walls into social networks, third party forums, and online review sites. At a minimum, they must monitor and develop a triage system. Linear Escalation Now Fragmented: Previously, call center and customer care issues were cleanly routed into queues using support software, now, it’s dirty and messy as the social web is filled with unstructured data, multiple instances repeated across social networks, and a rapidly changing discussion in real time. Customer Woes Escalate in Public in Real Time. In a few of the most extreme cases like Motrin Moms or Dooce vs Whirlpool we saw these issues escalate during a weekend. As a result, corporations must practice their firedrills in the anticipation of a Friday night crises before a three day weekend when executives are away. Anyone in Company can be in Support. Unlike prior years where support was often routed to trained dedicated customer care professionals, now anyone in the company can participate in online tools and support customers. This poses significant threats and opportunities for scale. Customers Can Do Your Job For You: Similar to #5, companies now can tap into their customers (yes, those people who give you money) to do your job for you, but you’ll nee to provide them with service, recognition, and access. Must Factor in Social Influence –But Know When To Draw the Line. While we’ve already documented the many examples of punkings, we also need to curb our instant reaction to catering to influencers as this could cause bad behavior from influencers in future scenarios. Special Treatment is Shared in Public: Related to #7, assume special treatment to angry customers is now public, as they’ll tell others around them what worked –potentially forgoing your business model. Support is the New Marketing. As prospects read reviews from your existing customers, they will undoubltly read reviews on ratings sites, blogs, and forums. Since we know customers trust each other often more brands themselves the support group is one of the most important business units in the company, and cannot be ‘swept under the rug’. Must Seek New Business Models. Many support organizations are now profit centers, they generate revenues through service level agreements or upgrade and upselling. 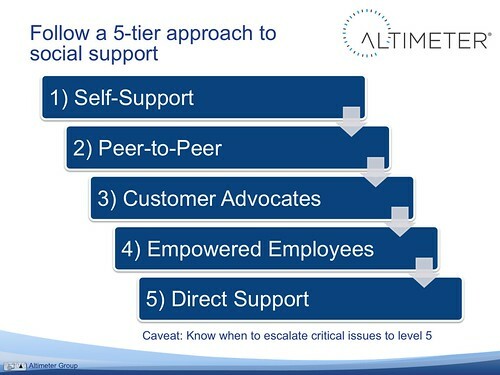 Now, because customers can self-support each other, many support executives must rethink their strategy. Savvy companies like Autodesk and Intuit have already integrate social support communities right into the product experience. There were a few resources I pointed to in this webinar, such as: the social media crises list aka known as the “Punkd” list, we’ll have a report diving deeper into these crises soon. Also see why website integration is a key priority in 2011 (data), and how companies are adopting the Hub and Spoke model (data), responding to influencers (a controversial topic) our research reports on the Career Path of the Social Strategist (report) and How to Budget for Social Business (report). Also, if you wanted to learn more from Moxie Software (our hosts who made this webinar possible) download the PDF version of the slides, or get a demo. I’d like to thank Christine Tran, in our research team for her assistance.